Helstrom is found in the impenetrable center of Black Marsh, also known as the dark heart. Various waterways like the Onkobra River eventually lead into the center of the province, and by extension, Helstrom. As mentioned before, Helstrom is found in an area of Black Marsh where neither man. nor mer could be able to traverse. The marsh is also very dense, where the city of Helstrom is safe enough to avoid an Imperial siege. In the region lies Helstrom Heart-Mud, which is known for being really dark. The Helstrom Ancestor Lizard is believed by some scholars to be the predecessor to the Argonian. Helstrom is neighbored by several settlements, including Alten Markmont in the southeast, Greenspring in the southwest, and Tenmar Wall in the north. Helstrom's founding is unknown, but the Helstrom Ancestor Lizard, which is presumably found in the area, is a supposed ancestor of the modern-day Argonians. In 1E 2811, Emperor Reman Cyrodiil II had launched a military campaign against Argonia, in the effort to take control. The battle that brought forth the Blackwater War was the Battle of Argonia. The Imperial Legion had won a decisive battle against the Argonians, who had severe casualties while the Empire was taking little damage. Those Argonians would retreat into the deep interior and Helstrom, while the rest of Argonia would face against the Empire in the Blackwater War. 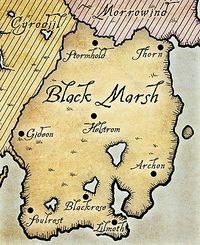 When the Blackwater War ended in 1E 2837, the Imperial Province of Black Marsh was founded, and Helstrom was considered a city of the Second Empire. During the Imperial Simulacrum in the late Third Era, the city-state of Helstrom was ruled by King Germanus. It had a rivalry with Stormhold. This page was last modified on 11 February 2019, at 23:29.